Finance for $409 per month at 6.25% APR for 72 months with $2,710 down payment. Payment expires on 04/30/19. Estimated Finance payment based upon 6.25% APR for 72 months, with a down payment of $2,710. Excludes title, taxes, registration, and license fees. Some customers will not qualify. See your authorized dealer for complete details on this and other offers. Residency restrictions may apply. Lease for $287/month for 36 months with $2,710 due at signing including $0 Security Deposit and 10,000 miles per year. Payment expires on 04/30/19. Estimated Lease payment based on 36 months and $2,710 due at lease signing. Cash due at signing includes $3,454 capitalization cost reduction, which includes $650 acquisition fee, plus a required security deposit of $0, and first month's lease payment of $287. Excludes title, taxes, registration, and license fees. Total monthly payments equal $13,766. Mileage charge of $0.25 per mile over 10,000 miles. Not all consumers will qualify. Residency restrictions may apply. Finance for $412 per month at 6.25% APR for 72 months with $2,730 down payment. Payment expires on 04/30/19. Estimated Finance payment based upon 6.25% APR for 72 months, with a down payment of $2,730. Excludes title, taxes, registration, and license fees. Some customers will not qualify. See your authorized dealer for complete details on this and other offers. Residency restrictions may apply. Lease for $289/month for 36 months with $2,730 due at signing including $0 Security Deposit and 10,000 miles per year. Payment expires on 04/30/19. Estimated Lease payment based on 36 months and $2,730 due at lease signing. Cash due at signing includes $3,471 capitalization cost reduction, which includes $650 acquisition fee, plus a required security deposit of $0, and first month's lease payment of $289. Excludes title, taxes, registration, and license fees. Total monthly payments equal $13,863. Mileage charge of $0.25 per mile over 10,000 miles. Not all consumers will qualify. Residency restrictions may apply. Finance for $413 per month at 6.25% APR for 72 months with $2,740 down payment. Payment expires on 04/30/19. Estimated Finance payment based upon 6.25% APR for 72 months, with a down payment of $2,740. Excludes title, taxes, registration, and license fees. Some customers will not qualify. See your authorized dealer for complete details on this and other offers. Residency restrictions may apply. Lease for $290/month for 36 months with $2,740 due at signing including $0 Security Deposit and 10,000 miles per year. Payment expires on 04/30/19. Estimated Lease payment based on 36 months and $2,740 due at lease signing. Cash due at signing includes $3,480 capitalization cost reduction, which includes $650 acquisition fee, plus a required security deposit of $0, and first month's lease payment of $290. Excludes title, taxes, registration, and license fees. Total monthly payments equal $13,911. Mileage charge of $0.25 per mile over 10,000 miles. Not all consumers will qualify. Residency restrictions may apply. Finance for $418 per month at 6.25% APR for 72 months with $2,769 down payment. Payment expires on 04/30/19. Estimated Finance payment based upon 6.25% APR for 72 months, with a down payment of $2,769. Excludes title, taxes, registration, and license fees. Some customers will not qualify. See your authorized dealer for complete details on this and other offers. Residency restrictions may apply. Lease for $293/month for 36 months with $2,769 due at signing including $0 Security Deposit and 10,000 miles per year. Payment expires on 04/30/19. Estimated Lease payment based on 36 months and $2,769 due at lease signing. Cash due at signing includes $3,507 capitalization cost reduction, which includes $650 acquisition fee, plus a required security deposit of $0, and first month's lease payment of $293. Excludes title, taxes, registration, and license fees. Total monthly payments equal $14,054. Mileage charge of $0.25 per mile over 10,000 miles. Not all consumers will qualify. Residency restrictions may apply. Finance for $444 per month at 6.25% APR for 72 months with $2,948 down payment. Payment expires on 04/30/19. Estimated Finance payment based upon 6.25% APR for 72 months, with a down payment of $2,948. Excludes title, taxes, registration, and license fees. Some customers will not qualify. See your authorized dealer for complete details on this and other offers. Residency restrictions may apply. Lease for $308/month for 36 months with $2,948 due at signing including $0 Security Deposit and 10,000 miles per year. Payment expires on 04/30/19. Estimated Lease payment based on 36 months and $2,948 due at lease signing. Cash due at signing includes $4,091 capitalization cost reduction, which includes $650 acquisition fee, plus a required security deposit of $0, and first month's lease payment of $308. Excludes title, taxes, registration, and license fees. Total monthly payments equal $15,177. Mileage charge of $0.25 per mile over 10,000 miles. Not all consumers will qualify. Residency restrictions may apply. Finance for $448 per month at 6.25% APR for 72 months with $2,968 down payment. Payment expires on 04/30/19. Estimated Finance payment based upon 6.25% APR for 72 months, with a down payment of $2,968. Excludes title, taxes, registration, and license fees. Some customers will not qualify. See your authorized dealer for complete details on this and other offers. Residency restrictions may apply. Lease for $311/month for 36 months with $2,968 due at signing including $0 Security Deposit and 10,000 miles per year. Payment expires on 04/30/19. Estimated Lease payment based on 36 months and $2,968 due at lease signing. Cash due at signing includes $4,108 capitalization cost reduction, which includes $650 acquisition fee, plus a required security deposit of $0, and first month's lease payment of $311. Excludes title, taxes, registration, and license fees. Total monthly payments equal $15,275. Mileage charge of $0.25 per mile over 10,000 miles. Not all consumers will qualify. Residency restrictions may apply. Finance for $452 per month at 6.25% APR for 72 months with $3,000 down payment. Payment expires on 04/30/19. Estimated Finance payment based upon 6.25% APR for 72 months, with a down payment of $3,000. Excludes title, taxes, registration, and license fees. Some customers will not qualify. See your authorized dealer for complete details on this and other offers. Residency restrictions may apply. Lease for $310/month for 36 months with $3,000 due at signing including $0 Security Deposit and 10,000 miles per year. Payment expires on 04/30/19. Estimated Lease payment based on 36 months and $3,000 due at lease signing. Cash due at signing includes $4,265 capitalization cost reduction, which includes $650 acquisition fee, plus a required security deposit of $0, and first month's lease payment of $310. Excludes title, taxes, registration, and license fees. Total monthly payments equal $15,424. Mileage charge of $0.25 per mile over 10,000 miles. Not all consumers will qualify. Residency restrictions may apply. Finance for $454 per month at 6.25% APR for 72 months with $3,010 down payment. Payment expires on 04/30/19. Estimated Finance payment based upon 6.25% APR for 72 months, with a down payment of $3,010. Excludes title, taxes, registration, and license fees. Some customers will not qualify. See your authorized dealer for complete details on this and other offers. Residency restrictions may apply. Lease for $312/month for 36 months with $3,010 due at signing including $0 Security Deposit and 10,000 miles per year. Payment expires on 04/30/19. Estimated Lease payment based on 36 months and $3,010 due at lease signing. Cash due at signing includes $4,274 capitalization cost reduction, which includes $650 acquisition fee, plus a required security deposit of $0, and first month's lease payment of $312. Excludes title, taxes, registration, and license fees. Total monthly payments equal $15,473. Mileage charge of $0.25 per mile over 10,000 miles. Not all consumers will qualify. Residency restrictions may apply. 1Excludes L model. Not available with special financing, lease and some other offers. See participating dealer for details. 2Excludes L model. Not available with special financing, lease and some other offers. See participating dealer for details. 3Must qualify through GM Financial. Not available with special finance, lease, or some other offers. Take delivery by 04-30-2019. See dealer for details. 419-40CAO. Conquest % Cash Back. Stackable % Cash Back for customers who have owned or leased a 2005 or newer Non-GM Vehicle for a minimum of 30 days. Allowance Available on Retail Program Info. Compatible with % Off and % Conquest Private Offer ONLY. 5see dealer for details 6See dealer for details 7see dealer for details 8see dealer for details 9see dealer for details 10see dealer for details 11see dealer for details 12Excludes L models. Monthly payment is $13.89 for every $1,000 you finance. Example down payment: 5.2%. Must finance with GM Financial. Some customers may not qualify. Not available with lease and some other offers. Take new retail delivery by 4/30/2019. See dealer for details. Finance for $457 per month at 6.25% APR for 72 months with $3,030 down payment. Payment expires on 04/30/19. Estimated Finance payment based upon 6.25% APR for 72 months, with a down payment of $3,030. Excludes title, taxes, registration, and license fees. Some customers will not qualify. See your authorized dealer for complete details on this and other offers. Residency restrictions may apply. Lease for $314/month for 36 months with $3,030 due at signing including $0 Security Deposit and 10,000 miles per year. Payment expires on 04/30/19. Estimated Lease payment based on 36 months and $3,030 due at lease signing. Cash due at signing includes $4,292 capitalization cost reduction, which includes $650 acquisition fee, plus a required security deposit of $0, and first month's lease payment of $314. Excludes title, taxes, registration, and license fees. Total monthly payments equal $15,572. Mileage charge of $0.25 per mile over 10,000 miles. Not all consumers will qualify. Residency restrictions may apply. 1Must qualify through GM Financial. Not available with special finance, lease, or some other offers. Take delivery by 04-30-2019. See dealer for details. 2Not available with special finance or lease offers. Take delivery by 04-30-2019. 3Residency restrictions apply. 419-40CAO. Conquest % Cash Back. Stackable % Cash Back for customers who have owned or leased a 2005 or newer Non-GM Vehicle for a minimum of 30 days. Allowance Available on Retail Program Info. Compatible with % Off and % Conquest Private Offer ONLY. 5see dealer for details 6see dealer for details 7see dealer for details 8see dealer for details 9see dealer for details 10see dealer for details 11Excludes L models. Monthly payment is $13.89 for every $1,000 you finance. Example down payment: 5.2%. Must finance with GM Financial. Some customers may not qualify. Not available with lease and some other offers. Take new retail delivery by 4/30/2019. See dealer for details. Finance for $441 per month at 6.25% APR for 72 months with $2,928 down payment. Payment expires on 04/30/19. Estimated Finance payment based upon 6.25% APR for 72 months, with a down payment of $2,928. Excludes title, taxes, registration, and license fees. Some customers will not qualify. See your authorized dealer for complete details on this and other offers. Residency restrictions may apply. Lease for $306/month for 36 months with $2,928 due at signing including $0 Security Deposit and 10,000 miles per year. Payment expires on 04/30/19. Estimated Lease payment based on 36 months and $2,928 due at lease signing. Cash due at signing includes $4,073 capitalization cost reduction, which includes $650 acquisition fee, plus a required security deposit of $0, and first month's lease payment of $306. Excludes title, taxes, registration, and license fees. Total monthly payments equal $15,078. Mileage charge of $0.25 per mile over 10,000 miles. Not all consumers will qualify. Residency restrictions may apply. Finance for $470 per month at 6.25% APR for 72 months with $3,119 down payment. Payment expires on 04/30/19. Estimated Finance payment based upon 6.25% APR for 72 months, with a down payment of $3,119. Excludes title, taxes, registration, and license fees. Some customers will not qualify. See your authorized dealer for complete details on this and other offers. Residency restrictions may apply. Lease for $329/month for 36 months with $3,119 due at signing including $0 Security Deposit and 10,000 miles per year. Payment expires on 04/30/19. Estimated Lease payment based on 36 months and $3,119 due at lease signing. Cash due at signing includes $3,931 capitalization cost reduction, which includes $650 acquisition fee, plus a required security deposit of $0, and first month's lease payment of $329. Excludes title, taxes, registration, and license fees. Total monthly payments equal $15,742. Mileage charge of $0.25 per mile over 10,000 miles. Not all consumers will qualify. Residency restrictions may apply. Finance for $472 per month at 6.25% APR for 72 months with $3,129 down payment. Payment expires on 04/30/19. Estimated Finance payment based upon 6.25% APR for 72 months, with a down payment of $3,129. Excludes title, taxes, registration, and license fees. Some customers will not qualify. See your authorized dealer for complete details on this and other offers. Residency restrictions may apply. Lease for $330/month for 36 months with $3,129 due at signing including $0 Security Deposit and 10,000 miles per year. Payment expires on 04/30/19. Estimated Lease payment based on 36 months and $3,129 due at lease signing. Cash due at signing includes $3,940 capitalization cost reduction, which includes $650 acquisition fee, plus a required security deposit of $0, and first month's lease payment of $330. Excludes title, taxes, registration, and license fees. Total monthly payments equal $15,791. Mileage charge of $0.25 per mile over 10,000 miles. Not all consumers will qualify. Residency restrictions may apply. Finance for $472 per month at 6.25% APR for 72 months with $3,132 down payment. Payment expires on 04/30/19. Estimated Finance payment based upon 6.25% APR for 72 months, with a down payment of $3,132. Excludes title, taxes, registration, and license fees. Some customers will not qualify. See your authorized dealer for complete details on this and other offers. Residency restrictions may apply. Lease for $330/month for 36 months with $3,132 due at signing including $0 Security Deposit and 10,000 miles per year. Payment expires on 04/30/19. Estimated Lease payment based on 36 months and $3,132 due at lease signing. Cash due at signing includes $3,943 capitalization cost reduction, which includes $650 acquisition fee, plus a required security deposit of $0, and first month's lease payment of $330. Excludes title, taxes, registration, and license fees. Total monthly payments equal $15,808. Mileage charge of $0.25 per mile over 10,000 miles. Not all consumers will qualify. Residency restrictions may apply. Finance for $474 per month at 6.25% APR for 72 months with $3,142 down payment. Payment expires on 04/30/19. Estimated Finance payment based upon 6.25% APR for 72 months, with a down payment of $3,142. Excludes title, taxes, registration, and license fees. Some customers will not qualify. See your authorized dealer for complete details on this and other offers. Residency restrictions may apply. Lease for $331/month for 36 months with $3,142 due at signing including $0 Security Deposit and 10,000 miles per year. Payment expires on 04/30/19. Estimated Lease payment based on 36 months and $3,142 due at lease signing. Cash due at signing includes $3,952 capitalization cost reduction, which includes $650 acquisition fee, plus a required security deposit of $0, and first month's lease payment of $331. Excludes title, taxes, registration, and license fees. Total monthly payments equal $15,856. Mileage charge of $0.25 per mile over 10,000 miles. Not all consumers will qualify. Residency restrictions may apply. Finance for $478 per month at 6.25% APR for 72 months with $3,168 down payment. Payment expires on 04/30/19. Estimated Finance payment based upon 6.25% APR for 72 months, with a down payment of $3,168. Excludes title, taxes, registration, and license fees. Some customers will not qualify. See your authorized dealer for complete details on this and other offers. Residency restrictions may apply. Lease for $334/month for 36 months with $3,168 due at signing including $0 Security Deposit and 10,000 miles per year. Payment expires on 04/30/19. Estimated Lease payment based on 36 months and $3,168 due at lease signing. Cash due at signing includes $3,975 capitalization cost reduction, which includes $650 acquisition fee, plus a required security deposit of $0, and first month's lease payment of $334. Excludes title, taxes, registration, and license fees. Total monthly payments equal $15,982. Mileage charge of $0.25 per mile over 10,000 miles. Not all consumers will qualify. Residency restrictions may apply. Finance for $482 per month at 6.25% APR for 72 months with $3,194 down payment. Payment expires on 04/30/19. Estimated Finance payment based upon 6.25% APR for 72 months, with a down payment of $3,194. Excludes title, taxes, registration, and license fees. Some customers will not qualify. See your authorized dealer for complete details on this and other offers. Residency restrictions may apply. Lease for $332/month for 36 months with $3,194 due at signing including $0 Security Deposit and 10,000 miles per year. Payment expires on 04/30/19. Estimated Lease payment based on 36 months and $3,194 due at lease signing. Cash due at signing includes $4,438 capitalization cost reduction, which includes $650 acquisition fee, plus a required security deposit of $0, and first month's lease payment of $332. Excludes title, taxes, registration, and license fees. Total monthly payments equal $16,385. Mileage charge of $0.25 per mile over 10,000 miles. Not all consumers will qualify. Residency restrictions may apply. Finance for $483 per month at 6.25% APR for 72 months with $3,204 down payment. Payment expires on 04/30/19. Estimated Finance payment based upon 6.25% APR for 72 months, with a down payment of $3,204. Excludes title, taxes, registration, and license fees. Some customers will not qualify. See your authorized dealer for complete details on this and other offers. Residency restrictions may apply. Lease for $334/month for 36 months with $3,204 due at signing including $0 Security Deposit and 10,000 miles per year. Payment expires on 04/30/19. Estimated Lease payment based on 36 months and $3,204 due at lease signing. Cash due at signing includes $4,446 capitalization cost reduction, which includes $650 acquisition fee, plus a required security deposit of $0, and first month's lease payment of $334. Excludes title, taxes, registration, and license fees. Total monthly payments equal $16,435. Mileage charge of $0.25 per mile over 10,000 miles. Not all consumers will qualify. Residency restrictions may apply. Finance for $486 per month at 6.25% APR for 72 months with $3,224 down payment. Payment expires on 04/30/19. Estimated Finance payment based upon 6.25% APR for 72 months, with a down payment of $3,224. Excludes title, taxes, registration, and license fees. Some customers will not qualify. See your authorized dealer for complete details on this and other offers. Residency restrictions may apply. Lease for $336/month for 36 months with $3,224 due at signing including $0 Security Deposit and 10,000 miles per year. Payment expires on 04/30/19. Estimated Lease payment based on 36 months and $3,224 due at lease signing. Cash due at signing includes $4,464 capitalization cost reduction, which includes $650 acquisition fee, plus a required security deposit of $0, and first month's lease payment of $336. Excludes title, taxes, registration, and license fees. Total monthly payments equal $16,534. Mileage charge of $0.25 per mile over 10,000 miles. Not all consumers will qualify. Residency restrictions may apply. With the new Chevrolet Equinox, available at our Macedon dealership, you can get it all. It effortlessly combines what every driver aspires for, in his or her vehicle – style, safety, performance, and technology. The new design of the Chevrolet Equinox, offered on our lot in Macedon, makes its presence unmistakable on the road. The LED daytime running lamps add to the appeal of this vehicle. 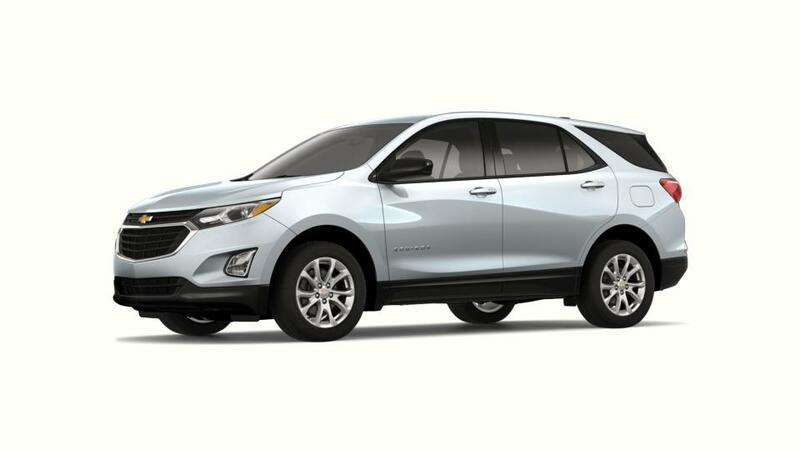 Further, the new Chevrolet Equinox, featured at our Macedon showroom, offers loads of space and you will not have to leave people or luggage behind. It scores on safety too with features, like Safety alert Seat, Surround Vision, rear cross traffic alert, and more. Visit our dealership if you are looking for a new model of this vehicle. We will be glad to help you drive home in the brand new Chevrolet Equinox from our Macedon dealership. If versatility intertwined with luxurious spacing and an array of features is your thing then this model is what you are looking for. So come and grab your own new Chevrolet Equinox from our Macedon showroom today!